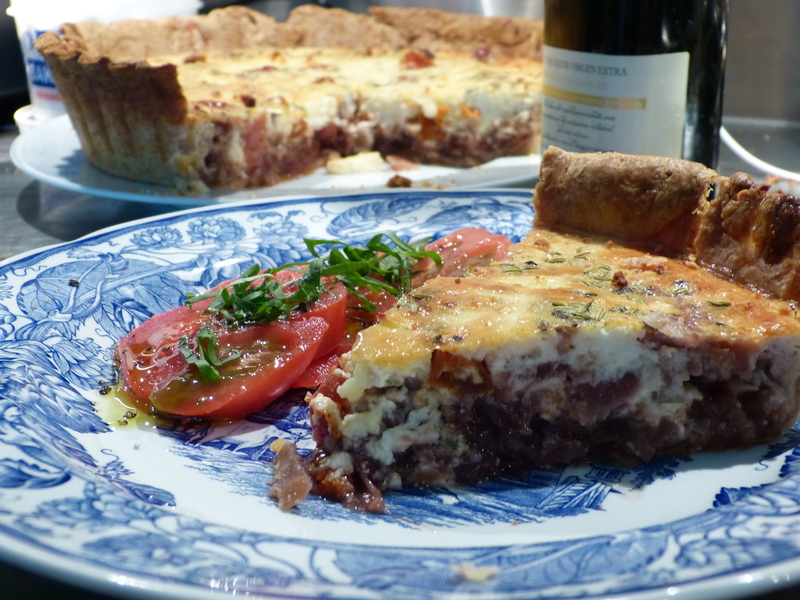 There was a lot of tarty talk on Twitter yesterday morning, kicked off by @lawyer_eats who was making a Roquefort flan from Simon Hopkinson’s Good Cook book. Chat about various recipes ensued and my imagination took the bait. So instead of having a light tomato salad as planned, found myself leafing through cook books looking for a recipe for a buttery tart. Hardly cooking for one, but I brought a wedge to work. My editor was well fed today…although my bottom was a little soggy. I thought I’d check out pastry recipes in Dani Valent’s In the Mix book, which is specifically for Thermomix users of the more ambitious persuasion. 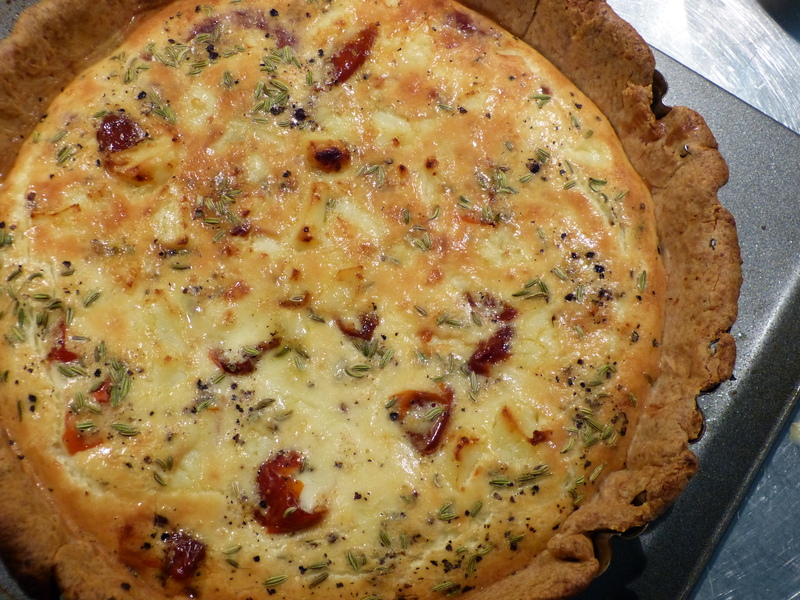 A recipe for onion jam tart with cheddar cheese pastry stood out and my recipe is inspired by it. I used what I had in the fridge so mascarpone instead of cream cheese, fennel seeds instead of caraway and some hot piquilo chilis for a bit of pep. I’ve also substituted some wholemeal spelt flour in the pastry which is really nutty and crisp but all white flour would work just fine. I’ve written up the Thermomix recipe first and a non-Thermomix method at the bottom. I haven’t tested the non-Thermomix method however…so don’t sue me. First, the pastry. Put the flour, butter, salt and parmesan into the bowl of the Thermomix and mix 10 seconds/Speed 6. Add half the water and mix for another 5 seconds/speed 6. The dough should cling to the blade for not be too wet or too dry. If it’s too dry, add a little more water. Knead the dough on the bread setting for 20 seconds and then turn out onto a sheet of cling film. Flatten to about 1.5cm thick, wrap in cling and place in the fridge for half an hour. Now make the Onion Jam. Place the onions and garlic in the Thermomix bowl and process for 4 seconds/speed 5. You want a fairly rough chop. Add the oil and salt and cook for 8 minutes/100degrees/Reverse speed 1. Cook for 14 minutes/100 degrees/ Reverse Speed spoon/MC off. Roll out the pastry between two sheets of cling film until it is 3mm thick. Remove the top layer of cling film and turn the pastry over into a 30cm loose bottomed tart tin. Remove the cling film and press the pastry into the tin. Roll up a piece of baking parchment into a ball and then un-ball it and lay loosely over the pastry. Fill with baking beans or coins and bake blind for 20mins at 190C. Remove the baking beans and parchment and bake for a final ten minutes to crisp the pastry. Fill the bottom of the pastry case with the onion jam in an even layer. Cover with the mascarpone mixture and add the piquilo peppers, crumble on the cheshire cheese and sprinkle on the fennel seeds. Bake at 190C for about 35 minutes or until the top is set and a just turning golden brown. Pulse the flours, butter, salt and parmesan in a food processor until they have the texture of sand. With the processor running, add water until the dough is just holding to the blade. Turn out and follow the method above. For the jam: Roughly chop the onions and garlic. Heat the oil in a heavy based pan and add the onions. Cook without colouring on a medium to low heat for about 20 minutes, stirring regularly. Add the soy, vinegar and sugar and cook on a medium heat uncovered until the onions are the consistency of jam. For the filling, whisk together the mascarpone, milk and eggs in a large bowl. Then follow the recipe as above.